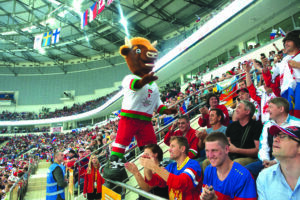 From the President of Belarus hitting the ice, to young players ready to break out onto the world stage, Sports writer GREGORY MILLER explores what makes hockey a source of national pride for fans within the nation and a thrilling show for spectators all over the world. In which countries would political leaders play a fast-paced, thrilling game of hockey – the USA, Canada, Germany? Undoubtedly, it would be hard to imagine many of the world leaders putting on their skates and hitting a puck. Yet, in Belarus, President Alexander Lukashenko looks natural in the ice hockey rink. There is a saying about leadership: “Great leaders don’t tell you what to do – they show you how it’s done.” Even at 60 years of age, the President of Belarus is a chief in the ice hockey rink and plays the sport exceptionally well. He shows that he is a leader, not by using his official title, but by playing with skillfulness and love for the game. Furthermore, the President’s passion for hockey is not just his own, it is one that is shared with all Belarusians. Last summer, on a nice warm day in northwestern Belarus, the thought of a swim or jog lay furthest from the minds of a group of young men putting on their skates in the Ice Palace rink found in the city of Lida, only 100 miles west of the capital city, Minsk. Instead, these young athletes were honed in on one thing only: ice hockey. Everywhere, stopwatches were seen gripped in the hands of trainers as the training camp of the Belarusian Under 18’s (U18) National Hockey Team got underway. This camp, organized by the Belarusian Ice Hockey Federation (BIHF), included trainers from North America such as Todd Woodcroft, Jay Woodcroft and Troy Stevens. These players knew that when they hopped on the ice, it was for much more than just drills. They were getting the training system that is used by professional players in the world’s major leagues, including the National Hockey League (NHL). 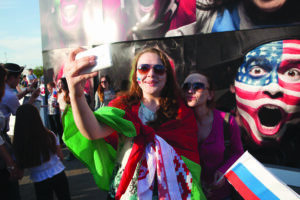 of the 2015 training camp, however, was associated with the fact that for the first time young Belarusian players were being exposed to advanced practices that were prevalent in the United States and Canada. The new cutting-edge training was different from the ones that were used by Belarusian trainers. The organizers knew that when it came to the new generation of Belarusian hockey, being a world-class athlete required world-class training. Of course, Belarusian hockey fans have been cheering for ages, ever since Belarusian descendent and world hockey legend, Wayne Gretzky, hit the ice. Gretzky’s grandfather, Anthony Gretzky, was a Belarusian immigrant to Canada, and their relatives still live in Belarus today. Gretzky, who was correctly nicknamed “The Great One”, completed 20 seasons in the NHL from 1979 to 1999, playing for the Edmonton Oilers, Los Angeles Kings, St. Louis Blues and New York Rangers. Described as “the greatest hockey player ever” by the NHL, Gretzky is still the leading scorer in NHL history. He is also the only NHL athlete to score over 200 points in one season – a feat he accomplished four times. When Gretzky retired in 1999, he held 61 NHL records, and, as of 2014, he still holds 60 of his NHL records. Despite his fame, The Great One did not forget his roots or his fans, because in 2010 he traveled to Belarus to visit his relatives and see the fantastic land of hockey. Belarusian hockey players are learning increasingly more from the great masters of the American and Canadian hockey leagues. Even in older hockey players, the new approach to hockey is already having positive outcomes. 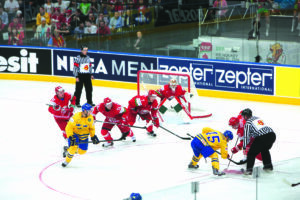 In 2015, the Belarusian national team was able to upset the U.S. team 5 – 2 at the World Hockey Championship, which also took place for the first time in Belarus. This incredible Belarusian team was led to victory by former NHL defenseman and Detroit Red Wings coach Dave Lewis. Also included on the roster were former NHL players, and brothers, Andrei and Sergei Kostitsyn.